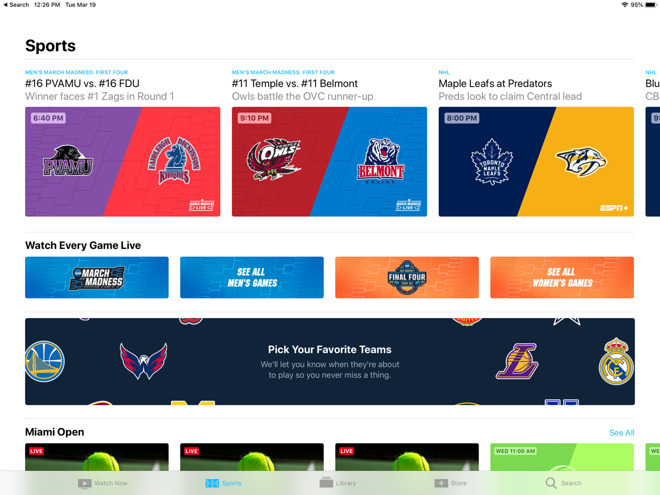 A team of a dozen employees work on the sports sections that appear in both tvOS and the TV app, spending their time monitoring as many major sporting events as possible to fill out the subsection with useful information fans may wish to know about. Made up of sports industry vets and at least one college athlete, the team try to predict what news is noteworthy and to send notifications to app users. The behind-the-scenes look at the team's work by Sports Illustrated reveals the small team works in the same area as the Apple Music employees, in a conference room christened "The Sports Ball Room." Working over the last year, the team spend time updating the app in a room containing many different viewing devices, as well as a large whiteboard keeping track of upcoming events and the latest scores. Ultimately the team works to curate the subcategory, though with the advent of machine learning, it is plausible the team could be teaching an algorithm what kind of information would be useful to a sports fan about a game, team, or player. The timing of the report is barely a week before Apple's event on March 25, where it is anticipated to unveil new services, including Apple News subscriptions and a video streaming offering. The existence of the team suggests, while sports are not currently a major product area for Apple, it may expand its interest in the field to produce something more substantial, possibly even its own sports streaming service. Outside the team, as well as some reporting under Apple News, Apple hasn't typically spent much effort on consumer-focused services relating to sports. While apps do exist for News, Weather, and Stocks, a similar app for sporting content has still yet to be made. As for sportscasting, it is hinted at by Apple SVP of Internet software and services Eddy Cue that sporting content could have a bigger focus. While Apple doesn't have much interest in competing against Amazon and Facebook over exclusive rights to sporting events, Cue warns "that's not to say we would never do sports, because who the heck knows. Never is a long time, but I don't think that's a problem right now." Cue pointed out to the report issues with sports rights, due to the high level of fragmentation between platforms and regions, which would interfere with the creation of any sportscasting service. "You really can't own the rights, so therefore at some point you need to solve some other problems," Cue mused, adding that Apple can't design for owning the rights as "if that's the only thing you're doing you're always going to be tiny." What I would love to see is a service where I can subscribe to the teams and/or sports I am interested in regardless of who carries it. For example, if I want to follow Michigan, I would have the option of all Wolverine sports or just certain sports and those games would be available regardless of what network or streaming service is carrying it. Another option would be to subscribe by conference- Big 10 or SEC, or by sport football or basketball. I have absolutely no interest in the talking head shows of ESPN or the others- the gossip shows are even worse. We are getting ready to see an attempt at the Balkanization of television. Disney is pulling content to drive people to their apps and services. AT&T is preparing to do the same thing now that they own Time-Warner. There are now more people with a paid streaming service than have a paid cable or satellite service and the cabal of companies that control both content and distribution are determined to force you into a bundle regardless of delivery method. Ugh, having worked at a cable company I know that sports are one of those things that are super expensive to license and have absolutely know value after the score of the game is known. It's a terrible content investment. Hunh? I have a whole folder fulla sports apps that display scores, schedules, standings, news, transactions. I hardly ever use any of them. So let me get this right: biggest corporation on the planet has a dozen dudes on payroll sitting in a room watching sports and thinking of ways to tell others. Where do I send my resume? This might be info that could be integrated into the Siri app.